Rash allergies can be caused by sensitivities to foods, inhaled allergens, and through direct contact with an irritant or allergen. Rash allergies often manifest as red patches, small bumps, and hives. The rash is usually very itchy, and can cause blisters to form on the skin, which increases the risk for infection. Atopic dermatitis, eczema, is not exactly an allergy, but it is often manifested in babies, children and adults who have allergies and asthma. Contact with jewelry can cause a rash allergy. Most watches and other forms of jewelry contain nickel, and if you have a nickel allergy, you will likely develop a rash allergy on the area where the jewelry touches the skin. Many people who wear watches and jewelry paint the surface that touches the skin with clear nail polish. The nail polish acts as a temporary barrier between the metal and the skin. The barrier won’t last long; therefore, you would have to paint the surface with nail polish as needed to prevent a rash allergy. Plants, such as tomato plants and poison ivy plants can cause a rash allergy when their leaves touch your skin. Other substances, such as perfumes, dyes, detergents, lotions, and fabrics can also cause allergic rashes. Latex is another source of allergen that can cause rashes on the skin. Severe reactions to any substance can cause a systemic allergic response much greater than skin rashes. For instance, exposure to poison ivy, latex and other substances can cause an immune allergic response that can cause you to become sick, dizzy, and there is also a chance you could go into anaphylactic shock. Anaphylaxis is caused when the allergic response tightens the airways enough to cause an obstruction. Your airway could be cut off, and your blood pressure could drop. In anaphylactic shock you could die from respiratory and cardiac arrest. Foods can cause skin rash allergies. For instance, if you were allergic to citrus, and you ate or drank something citrus, you could immediately break out in a skin rash. Your skin rash could turn into hives and whelps. It is very likely that when allergic to a substance, whether it is inhaled, ingested, or has contact with the body, that the proteins responsible for the allergic response are absorbed into the body. Allergens can be absorbed through the skin, through the gastrointestinal tract, and through the respiratory tract. You can be tested to find out what substances you are allergic to. Many people are allergic to grass and pollen. If you are allergic to grass, it is likely that you will start itching and scratching your skin after mowing the lawn. Mowing the lawn tends to stir up allergens into the air. On a hot day you might be sweating as you are mowing the grass. Grass debris is likely to come into contact with your skin, and you could develop an allergic skin rash. If you are allergic to grass, you might want to wait until after a rain before mowing. If you are very allergic to grass, you might want to consider hiring someone to cut your grass for you. If grass and pollen bother you, and you develop an allergic skin rash, you can take an antihistamine. 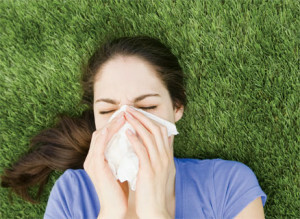 In fact, to prevent allergy symptoms, you could take an antihistamine before coming into contact with grass and pollen. Whether an allergy is caused by food, an inhaled substance or by direct contact with an allergen, allergy symptoms can manifest as a red, itchy, allergy rash. You can develop a rash and hives all over your body. Other allergy symptoms can cause runny eyes, stuffy and runny nose, and wheezing. More serious allergy responses can cause difficulty in swallowing, rapid heartbeat, and a drop in blood pressure, which leads to anaphylactic shock.